Trust our experts of 3D printing to lead you toward the Industry 4.0, wherever you may start it. Every part might not fit with 3D printing or be 3D printed with profitability. Therefore it is a necessity to understand the full extent of your business. Spare catalogues sometimes reach hundreds of thousands of references and datas are fragmented between several databases (ERP, PLM). 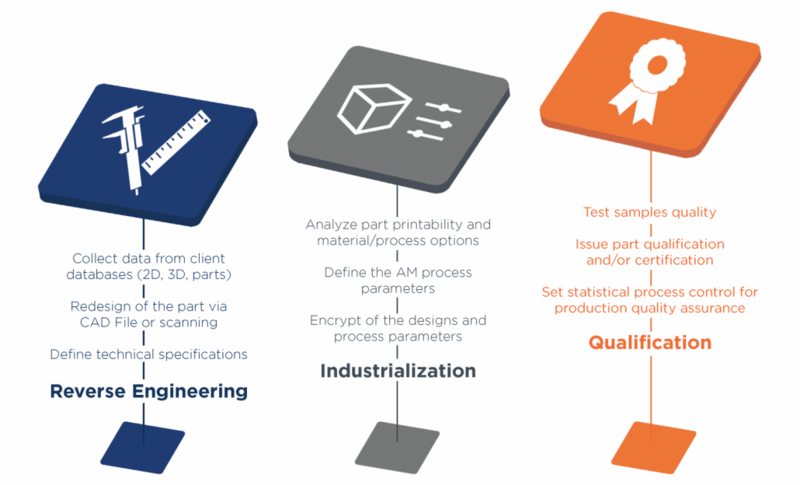 Determining the appropriate parts is not the easiest stage of implementing 3D printing. Spare Part 3D consulting service aims at creating awareness about 3D printing among industrial manufacturers, and supporting your company getting into 3D Printing in a smart way. Once we have a good understanding of your business value, Spare Parts 3D performs a profitability study for each selected part to ensure optimal savings, and to highlight the process changes required to capture that lost value. With this objective in mind, we developed DigiPART, the platform that stock digitally spare parts. With it, our customers can browse automatically through millions of parts and find the one that makes the most sense to be produced by 3D printing. We offer to our client our methodology, tools and expertise to single-out the right spares from both technical and business aspects. your spare parts catalogue in surface, to gather spares in clusters. the case studies to validate our analysis. Together, we are now able to plan a practical roadmap to set the next steps. Spare parts 3D commits its highly-skilled engineer team at your service to take care about the creation of your digital Spare Parts catalogue. We want to make inventories digital, for your parts to be always available as well as your machines to be repaired indefinitely. This online platform provides instantly the best technology and material to produce the part as well as the production cost and lead time for delivery. With DigiPART, our specific digital inventory, data are gathered with each part directly into a central cloud. We are now able to find out all the information for a decentralized production. We can now print any part anytime anywhere just by the click of a button. Thanks to our expertise, DigiPART, and technology we get rid of the problems of obsolescence, shortage and stock depreciation. And speaking about technology, discover the various technologies we can use to print your parts here. Spare Parts 3D collects orders, supervises production and parts delivery leveraging on our distributed qualified network of 3D Printers around the world. to protect your intellectual property (design, copyright…) and keep you the one single proprietary of your parts. in order to reach your delivery point as fast as 48 hours, and decreasing stocks and transportation as much as possible. ensuring you a qualified printing over various locations, for a final part certified according to your wishes. as you reduce your consumption to reach your customer, that means your environmental footprint! The large variety of our fellow manufacturers enables us to print you parts with every technology and every material needed. To join our network, each printer goes through a series of tests, and the remuneration model we apply to our providers foster the highest quality possible. To date, we have partnered with more than 60 3D printers located all around the world. Discover our global network here and be ready to connect your business and opportunities!